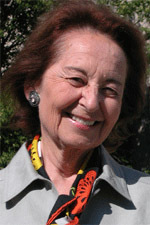 Born in Romania, Judith Nadler studied history and comparative literature at the University of Cluj before moving to Jerusalem, where she earned a Hebrew University bachelor’s degree in English and Romance studies and a library-science master’s degree. In 1966 she moved to Chicago with her husband, who took a medical-research position at Michael Reese Hospital. Fluent in seven languages, she was hired at the University Library to catalog foreign-language materials. Rising to section head, department head, assistant director for technical services, and Library associate director, last October she became director, replacing the retired Martin Runkle, AM’73. What’s your biggest challenge as director? For someone who has worked for the Library for 38 years, the challenge is to step up to a different level. I face a leadership challenge, the ability to lead the Library into the next century, to understand the issues, the changes in higher education, how a library is used, the way we interact with students and faculty, the way students interact with faculty and use the Library. What’s on your Library wish list? I hope to sustain the prestige, credibility, and centrality of the Library to the University established by my predecessor, as well as the rapport with our donors and faculty. On my specific wish list is to acquire the funds to build an extension for our growing collections. We are running out of space. Even with the exponential growth of electronic information we add approximately 150,000 items to the collections annually. Our collection-development budgets have been sheltered, at the expense of other activities. Adding resources, not just electronic but also print, remains a high priority. At this point we are talking about two onsite options for an addition—a hybrid facility combining browsable and high-density shelving, and an all high-density shelving facility. How would nonbrowsable stacks work? We believe we could effectively house a high proportion of our collection in high density using an automated retrieval system, a place you cannot go in but rather interact with through the Library’s ordering system. In most cases the requested items would be waiting at the circulation desk in the time it takes the patron to walk there. What are the Library’s greatest strengths? Our deep and broad collections. About 40 percent of our materials are non-English. Our area studies are extremely strong—East Asia, South Asia, the Middle East, Slavic. We provide access to almost everything we own. Many institutions fall behind in cataloging and their ability to provide access. We don’t have a backlog. Similarly, our special collections are more accessible than those at peer institutions. Another strength is our staff. We have a stable, dedicated staff, at lean levels (300 full-time equivalents) compared to our collections and the services we provide. But in a time of so much technological change an ongoing challenge is maintenance, training, and developing of employees. How have you helped to spearhead technology advances at the Library? Information technology has profoundly affected how we work in the Library and the ways we serve the University community. To best benefit from technology and to promote its advances, the Library realigned its information-technology units and established the Digital Library Development Center to provide leadership in the creation, implementation, and assessment of digital-library initiatives. The center operates with related campus resources to create an environment that integrates information resources and faculty research and educational activities. Given the December news that Google has partnered with five libraries to digitize their collections, how is the University keeping up with such technology? Google’s initiative to digitize the holdings of major research libraries is a boon and will ultimately change the way people learn about information and interact with it. However, digitization is only the first step. Organizing, preserving, and providing access to this information are activities historically performed by libraries. Building on powerful technology, we will join with our peers to make these resources available locally and to the world. What didn’t you know until you became Library director? When I first came here I knew we had wonderful collections and that the staff was very strong, dedicated, and very much a part of the University. In my few months in this office I’ve discovered an even more important resource: the faculty. I will make it my mission to cultivate this resource. I have heard talk of the fear of obsolescence of libraries, that we will be marginalized if we don’t become a Google type of operation. I don’t think libraries are a thing of the past but of the future. The faculty is the strongest ally in fighting the library’s obsolescence.